Edwin S. Porter's early silent western classic, with fourteen primitive scenes, comprised a narrative story with multiple plot lines. It contained prototypical elements that have been repeatedly copied by almost every western - a train holdup with six-shooters, a daring robbery accompanied by violence and death, a hastily-assembled posse's chase on horseback after the fleeing bandits, and the apprehension of the desperadoes after a showdown in the woods. D.W. Griffith's monumental technical masterpiece of epic film-making (although decidedly racist) included an exciting conclusion involving the KKK's race to restore order. The Klan on horseback were summoned, assembled and gathered for reinforcement. Ben Cameron (Henry Walthall), "the Little Colonel", led the Klan to the rescue of white womanhood, white honor, and white glory, in a 'head-on' tracking shot. It was an intense, action-packed, stupendous, last-minute rescue finale, a thrilling climax - interweaving the siege on the cabin, the chaos in Piedmont, Elsie Stoneman's (Lillian Gish) fate at the hands of Silas Lynch (George Siegmann), and the onrushing rescue by the Klan. During the rescue, the most famous sequence in the film, excitement was heightened by shots of the Klan alternating with shots of the endangered Elsie - the film exhibited masterful parallel editing. This film was memorable for the last minute, climactic scene in which David Bartlett (Richard Barthelmess) chased after cast-out love interest Anna Moore (Lillian Gish) who had fled into a blinding snowstorm. She fainted on one of the ice floes in the midst of an icy river, with her hand trailing into the freezing water. As the ice thawed the next morning and broke apart ("the great ice-break"), her lifeless form was caught unconscious on moving ice-floes and was swept downstream toward a precipitous waterfall. David nimbly jumped from ice block to ice block to try to reach her before the ice jam gave way - rushing to the falls. As Anna regained consciousness, but started to sink into the frigid water at the edge of the falls, David scooped her up and saved her, running perilously upstream on unstable blocks of ice to reach the shore. This chase comedy was written and directed by Buster Keaton and Clyde Bruckman, and filmed with a huge budget for its time ($400,000). It was memorable for its strong story-line of a single, brave, but foolish Southern Confederate train engineer Johnnie (Buster Keaton) doggedly in pursuit of his passionately-loved locomotive ("The General") and the blue-coated spies who had stolen it, AND the woman he loved. Each half of the film was predominantly composed of two train chases over the same territory. Each scene in the chase of the first half had a counterpart in the film's second half. In the first chase, Johnnie pursued his stolen locomotive taken to the North by the Union forces. In the second half, the Union spies chased Johnnie in his re-possessed General back to the South. The film concluded with a climactic battle at a river gorge, with the dramatic crash of the pursuit train into the Rock River in the film's most spectacular scene. The John Ford western had a spectacular, climactic hair-raising, dangerous stunt (a horse-leap and coach-slide) during the stagecoach chase across the alkali flat by Apache Indians. One of the Apaches (Enos Yakima Canutt, a famed stuntman) leapt from his mount alongside the moving stage onto the galloping lead horses of the stagecoach's team (a stagecoach was pulled by three pairs of horses: the lead, the swing, and the wheel teams). As he tried to grab the reins of the lead horse to control the stagecoach, Ringo (John Wayne) shot at him with his rifle from over Buck's shoulder. The Apache was struck and fell down among many sets of thundering hooves. He hung onto the rig's shaft or tongue (the projection on the bottom front of the wagon that connected the vehicle to the horses) while dragging along the ground. Then, after being shot a second time, the Apache warrior let go and slid between the wheels of the moving coach - the six horses and the stage's carriage rolled right over his prone body. The camera panned back to show that it wasn't a stunt dummy - the wounded Indian rolled aside and climbed slowly to his knees. This W.C. Fields film concluded with a memorable, zany slapstick, getaway car chase scene, reminiscent of the silent Mack Sennett Keystone Kops films. Egbert Sousè (Fields) was taken as hostage by a bank robber, used as a shield, and forced to drive a getaway car. 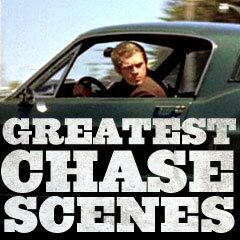 Following in three other chase cars through the city and country were the local police, the bank president, and a representative from the movie company. It was a superbly-timed chase - the cars zoomed and circled around, barely avoiding crashing into each other or other obstacles in the path. The getaway car careened through streets, over ditches (over the heads of ditchdiggers), around curves and up a mountainside, missing collisions at every turn with the pursuit vehicles. An unruffled Sousè gave non-chalant comments about the traffic and scenery. As his car started to fall apart, he joked: "The resale value of this car is going to be nil after you get over this trip." When asked by the thug in the back seat to give him the wheel, Egbert matter-of-factly pulled it off the steering column and gave it to him. When the rear tires started falling off, he calmly stated: "That's what I thought - going to be very dangerous." The robber was struck by the bough of a tree as he stood up and the car came to rest at the edge of a steep precipice. Sousè mumbled: "Have to take the boat from here on anyway." The unconscious thief was apprehended, and Sousè was a hero once again for thwarting another heist. Future "King of the B's" Roger Corman (28 years old) served as the producer and writer (and bit actor as a stunt driver) in this inferior John Ireland-co-directed film noirish action film - the first film for American International Pictures (then known as American Releasing Corporation or ARC). It was shot for $50,000 in nine days. Some of the car chase footage was stock footage, since special effects were not very well developed in the 1950s. It advertised "WIDE-SCREEN THRILLS!" and tauted that it was "filmed at the Pebble Beach International Sports Car Races" - in Monterey, California, where some of the footage was borrowed from. HIGH SPEED EXCITEMENT! When a Wanted Man -- Meets a Wanting Woman. It starred John Ireland as an innocently-convicted, escaped murderer Frank Webster (originally a truck driver) who met and kidnapped attractive, independent-minded blonde society girl Connie Adair (Dorothy Malone) at a roadside diner. He also drove off with her in her late-model white Jaguar XK120 sports car for his flight to Mexico. As part of his escape plan, Frank participated in an international, across-the-border sports car rally from California to Mexico. Frank: "How'd the cops find out?" Connie: "I turned you in." Frank: "How'd you get out?" Connie: "I set the building on fire." Frank: "You're a pretty dangerous character yourself." Connie: "You could've run away instead of helping him. Why didn't you?" Frank: "'Cause you're right, Connie, and I'm goin' back. Besides, I'm gettin' used to you." Connie: "Oh, Frank, what you really are is worth fighting for. And it isn't too late." As part of his vanity project, Mitchum also wrote the film's theme song Ballad of Thunder Road ("Thunder was his engine and white lightnin' was his load..."), and his real-life look-alike son James played a role as his younger mechanic-brother Robin. This definitive film (a cult drive-in favorite) was about transporting or running moonshine from the Appalachian Mountains area of backwoods rural North Carolina (Rillow Valley) and Harlan County (KY) while pursued by US Treasury (T-men) agents, including Troy Barrett (Gene Barry). Interference was also provided by ruthless crime syndicate city boss Carl Kogan (Jacques Aubuchon) from Memphis, Tennessee, who was threatening to consolidate all of the "action" of the local moonshine-bootleggers. Sleepy-eyed, cigarette-smoking, disillusioned tough-guy Mitchum played the romanticized but anti-hero role of a returning Korean War veteran named Lucas "Luke" Doolin, who resumed helping in his father Vernon's (Trevor Bardette) family business of bootlegging. He was a transporter ("those wild and reckless men") illegally carrying moonshine alcohol on the road to Memphis, in his souped-up 1950 gray stock-car Ford coupe with a modified 250 gallon tank in the trunk (carrying moonshine worth $1400), and an oil-slick device in the rear to waylay pursuers. He refused to bow to either the federal agents or to Kogan and quit his ways ("Why don't I quit breathin'?...I want to stop the clock, turn it back to another time in this valley that I knew before"). Evading stakeouts and roadblocks, government treasury agents (revenuers) driving Chevys, other moonshine competitors and organized crime gangsters/racketeers, were only some of the challenges, as Lucas dared Barrett: "you've got to catch me - if you can." In one attempt after his 1950 Ford was car-bombed by Kogan's men, he blasted his new 1957 Ford (with Tennessee plates) at 90 mph through a Treasury inspection roadblock consisting of two vehicles. The film's inevitably-deadly and tragic conclusion found Luke in one final run into Memphis after an intense crack-down, in which the daring and head-strong transporter was pursued by one of Kogan's henchmen. Driving alongside, Luke flicked his cigarette at the driver through his open window, causing the thug to careen off the side of the road. But then his own car was sabotaged by a T-agent nail-strip, and his car overturned and crashed into a utility station - killing him. Barrett provided Doolin's epitaph as electrical sparking occurred: "Mountain people. Wild-blooded, death-foolish. Yeah, that was Doolin, alright. He was a real stampeder." In the film's closing scene without dialogue, Robin returned to Roxie and took her hand, as a long stream of car headlights signaled Luke's body being brought back to the valley (the "Whippoorwill" song was reprised on the soundtrack). The film has been most heralded for its classic, memorable and spectacular 11-minute chariot race scene around a central divider strip composed of three statues thirty feet high, and grandstands on all sides, rising five stories high. The battle between the competitors was highlighted by a series of close-ups of the action. One by one, Messala (Stephen Boyd) eliminated the other drivers in the ferocious race, shattering their chariots. The climactic ending to the race occurred when the chariots of arch-rivals Messala and Ben-Hur (Charlton Heston), in hateful rivalry toward each other, ran neck-and-neck and slashed at each other. At one point, Ben-Hur's horses jumped over a crashed chariot, throwing the hero (stuntman Joe Canutt, son of famed stuntman Yakima Canutt) high into the air, yet he landed on his feet. Messala tried to destroy Ben-Hur's chariot by moving close with the blades, but as the wheels locked and he lost one of his wheels, Messala's chariot was splintered. He was dragged by his own team, then trampled, and run over by other teams of horses. Defeated, he was left bloody in the dirt, his body broken and horribly injured. One of the most iconic chase sequences involved the exciting (but unsuccessful) escape attempt by Allied POW loner "Cooler King" Hilts (Steve McQueen, but performed by stuntman Bud Elkins) - he sped away from the Nazi prison camp by vaulting a stolen German motorcycle over a six-foot barbed-wire prison fence at the Swiss border. The amazing race-for-his-life chase scene by the Man (a naked and unarmed safari tour leader/guide) (Cornel Wilde) as six tribe warriors give him a head start of 100 yards into the bush, in this adventure/chase film set in 19th century Africa co-directed by Cornel Wilde and Sven Persson.